The exercise in my morning prayer guide caught me by surprise. “Write down 10 things you are grateful for today.” I was coming down with a cold, and hadn’t yet reconciled myself to being out of bed, much less to facing a day of teaching with a scratchy voice and the prospects of being sick. Gratitude seemed like the last item on the menu of what I could offer the world. Seen at a cursory glance, the world certainly doesn’t seem to encourage gratitude. There is so much around us that evokes only dark and cynical thoughts. The world “as-it-is” has a lot of problems! Bombings, parents of my students who neglect their kids, our culture of materialism. But never mind the world outside. My own inner world is clouded with problems as well – pride, anger, a lack of faith. Doesn’t too much of life seem like “two steps forward and three steps back”? Richard Rohr writes that “God forbids us to accept “as-it-is” in favor of “what-God’s-love-can-make-it.” And so, putting aside my inner protests, I began to write my list. I became aware of the gorgeous flowering Christmas cactus in our bathroom. I had barely paid it a moment’s notice the last few days. How is it that I routinely miss the miracles under my nose? The night before, I realized with a start, as I often do, that it was already almost mid-week and I still hadn’t thought of a blog topic. Thoughts of “where was God” accompanied me as I drifted off to sleep, which was much better than the anxiety laden mindset I’d had a few minutes prior. Even if I was coming down with a cold, I was grateful that I could take a day off if I needed to (which I ended up doing). Earlier in the week, Paul (our pastor) had sent me an email. He’d been thinking of me while listening to a sermon online, and had some thoughts to share and encouraged me to listen to it too. I was grateful someone was looking out for me, offering mentorship. sapsuckers, purple finches, common redpolls, even a ruby-crowned kinglet – all of them such a delight to see and hear, and in my own backyard! Last weekend, by chance, I bumped into an old university friend I hadn’t seen in over 25 years. When I last knew him, I was a pretty confused and lost 20-something year old. In the wake of that meeting, I realized how rich my present life is – rich in meaning and friendship and community and spirit. Even amid struggles, I know God is never far off. As I continued my list, my heart began to shift and my doldrums lifted. Bible scholar N.T. Wright often says that God is “putting the world to rights”. As much as we are tempted to see the world “as-it-is” as small and getting smaller, God is always at work, pushing back the boundaries and making everything bigger. Where would we be without all these “chiropractic adjustments” that God does constantly, putting our hearts and world to rights? I thanked God for each story on my list and as I continued with my day, I was surprised to find how that simple exercise had changed my day for the better. My outer circumstances didn’t change one iota, but my inner eye was seeing better. At our Wednesday study night, we talked about the set point – the image of God that is our bottom line. Our imaginations can get so small and we easily lose perspective on who God really is. 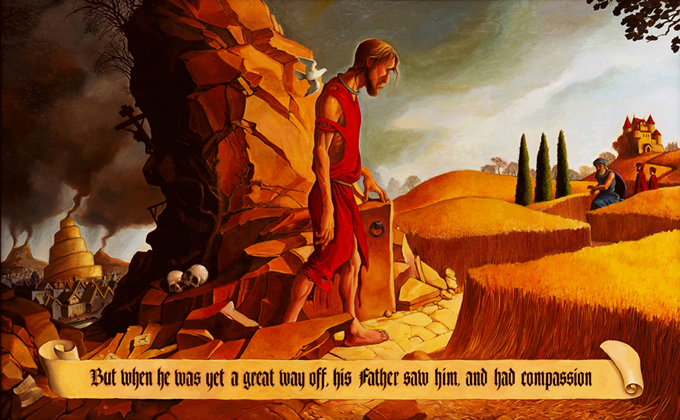 The story of the prodigal son offers an excellent set point. In this classic story of love and forgiveness, the son has done everything possible to separate himself from his father. Predictably, his world has become so small that he longs to eat the slop that the pigs he’s feeding are eating. As he returns, and hopes at best to be offered a job as a hired servant on his father’s farm, he finds instead a father who has been waiting the whole time and is ready to throw a party for his son who has returned. Rohr says that a true Christian is an optimist, and is asked to believe that Love is constantly transforming the world into something better, despite appearances. Am I a true Christian? I seem to be riddled with so much doubt and struggle that I’m often really not sure. Often I trudge home to God with a small imagination of who’s waiting for me. Thank God that the Parent who is waiting for me is not a “one-false-move” God, waiting to teach me a lesson for straying. Thank God that constantly, when I look up, I find forgiveness and a world that is much more expansive that I could have dreamed.